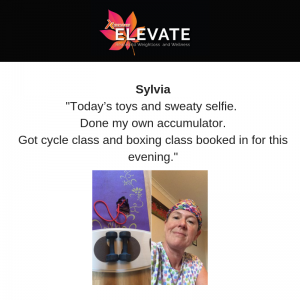 Our Elevate online group with Rachel Holmes are in their final month and now really understanding their body as far as nutrition, health and wellness and what works for them! 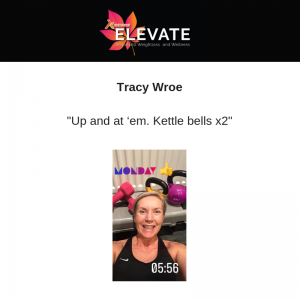 Elevate was a programme created by Rachel Holmes to provide information, daily coaching, nutritional protocols and guidance on HOW to reach your wellness, weight loss and health goals- not just impacting weight but sleep, stress, mental health, positivity and much more! 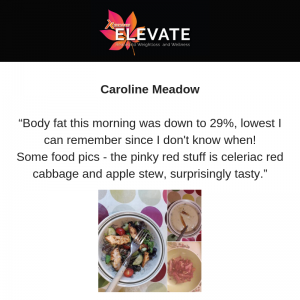 “Body fat this morning was down to 29%, lowest I can remember since I don’t know when! “Well what can i say!! 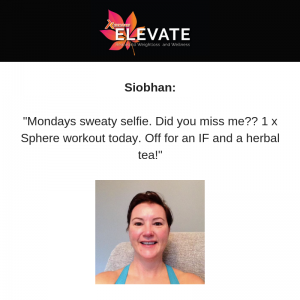 I have worked out 6/7 days this week and walked 10000 steps or more daily, i do pilates stretches every night and attend a pilates class every Thursday. I started this journey with Rachel way back in July when i did a 7 day sprinter and my goal originally was to lose weight,But since then The ‘weight loss’ has taken a bit of a back seat, per se, as my mindset now is that i need to be working out and staying healthy both in mind and body and as a result i make better food choices 80-90% of the time,! Dont get me wrong im still losing the weight but thats no longer my no 1 priority! Targets this week: 1 IF everyday. 2 No alcohol until December. 3 Kitchen closes after dinner. 3. Get up and exercise!!! But I now feel amazing,stronger,more focused ,& positive and in control. I love the whole Nutrition advice,I’ve learnt to recognise my body for what it needs. 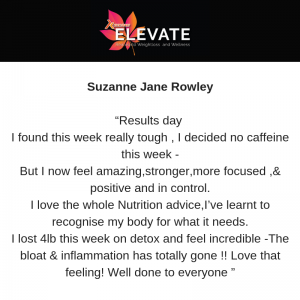 The bloat & inflammation has totally gone !! Love that feeling! 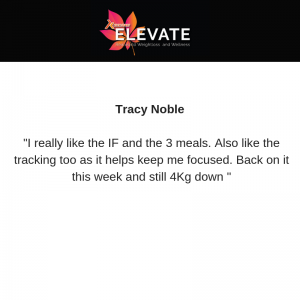 “So my results after a “Rapid Fat loss” week followed by a detox week …. Feeling back in control again and when I get by Nutrition back under control and I feel I’m winning .. I can handle other areas of my life much better. Energy levels have improved despite not enough sleep! Feeling better physically and mentally! There is no final destination with this. It takes work, determination, focus and effort!! This group is such a great place to be. Although I’ve not been posting a great deal. I do check in daily and you girls are so awesome. Really motivating and inspiring! 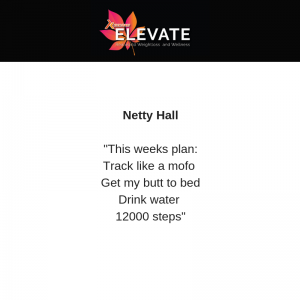 Goals for the week ahead are to get back on the case with daily Workouts, meditation and headspace!! 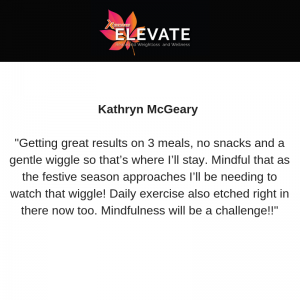 ELEVATE 2019 starts Monday 7th January and runs until Friday 14th April —- more details coming soon!